A boldly original tale about a girl who journeys through love and loss to find her mother — and discovers that everyone has a story to tell, including herself. "I used to think that a person would not know who I was, not really know me, until they heard about my mother." Four years, four months, and fifteen days ago, Natalie Gordon's mother walked out mid-sentence, before she finished what she was going to say. Now Natalie is traveling twenty-four hours on a bus to Florida to find her mother, to find herself, to find out something about love. Along the way, Natalie struggles to understand her relationship with Adam, a boy she pines for with near-obsession, and to her surprise, she meets people with stories like her own, stories about giving love and getting lost in the desire to be wanted. 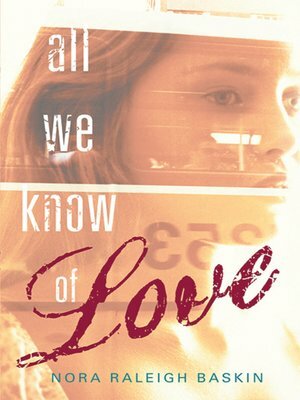 Acclaimed middle-grade novelist Nora Raleigh Baskin makes her young adult debut with a deeply resonant novel about secrets held and secrets shared, about having the courage to uncover all we know — and don't know — of love. Nora Raleigh Baskin is the author of What Every Girl (Except Me) Knows, a Publishers Weekly Cuffie Award winner for Most Promising New Author, among other popular middle-grade novels. She lives in Weston, Connecticut.